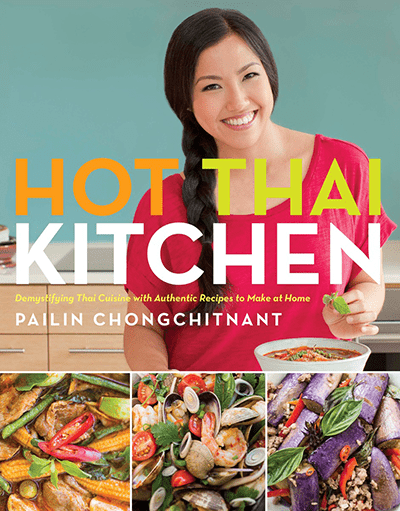 Great things happen when you combine two of the most popular Thai dishes into one! Green curry spring rolls are exactly what it sounds like: crispy spring rolls filled with that familiar flavour of Thai green curry we all love. It’s a great two-bite party appetizer that’s unique, and you can also wrap them in advance and fry then whenever you’re ready to serve. In this video I also show you how to make mini spring rolls using just the regular sized wrapper! Reheating tips: These also reheat very well so you can fry them all at once, and if they’ve cooled down half way through your party, simply stick them in a 375°F oven for 5 mins until they’re nice and crispy again. For the classic spring rolls, check out this recipe! Julienne about 10 basil leaves and add to a mortar and pestle, chop the rest and save it for later. Add the curry paste and pound until the leaves are blended into the paste. 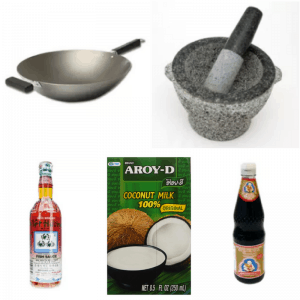 In a pot or wok, reduce coconut milk by about half. Add the curry paste and sugar, then cook, stirring constantly, until aromatic and thick. Add the ground chicken or turkey and break up the pieces so there are no more chunks. Keep cooking to dry out the mixture, until there is no liquid pooling at the bottom of the pan. Once dry, add all vegetables and kaffir lime leaves, then cook for about 1-2 minutes or just until the vegetables are softened slightly. Taste and add fish sauce as needed. Pour the cornstarch slurry over the mixture (don’t pour into one spot) and stir to mix immediately. You will notice that the mixture will start to hold together better. Turn off the heat and at this point if it still looks wet, stir in breadcrumbs to help absorb the liquid. You do not want any pooling liquid or it will make the wrapper soggy. Spread filling out onto a plate to let it cool to room temp before wrapping. Once filling is cooled, stir in the remaining chopped Thai basil. To wrap: If making mini spring rolls, cut 8-inch spring roll wrappers into 4 equal squares. See video at 5:20 for how to wrap. Use about 1 Tbsp of filling per piece. To fry: Heat frying oil in a pot to 350°F and fry until golden, about 4-5 minutes. Let cool slightly before serving with sweet chili dipping sauce.